Felicita – meaning ‘blessed’ in Italian – is the name of a traditional cookbook, published in 1929 and used in many homes throughout the European country ever since. And it’s provided great inspiration to the entrepreneurs behind new Wan Chai restaurant, Felicita 1929, which finds pride in a similar ‘blessed’ feel. A venture started by a couple of friends, this is an eatery that serves up solid Italian fare and boasts specialty pasta made on the premises. With simple white tablecloths and tiled floors, the atmosphere certainly has the hallmarks of a trattoria feel. To start, we order the deep-fried squid ink prawns ($98) and the tomato bruschetta ($58). The presentation of the seafood dish is bella because the black batter on each prawn creates an onyxesque contrast with the pinky shellfish. The bite-sized morsels are well seasoned and the slightly briny ink also enhances the flavour. Unfortunately the bruschetta doesn’t fare as well, though, as the tomatoes are grainy and have that tired mushy texture of vegetables that have been sitting too long in marinade. For mains, a couple of house specials catch our eye. 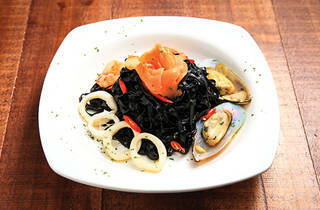 The Felicita homemade sautéed spicy seafood tagliatelle ($148) is a good dish. 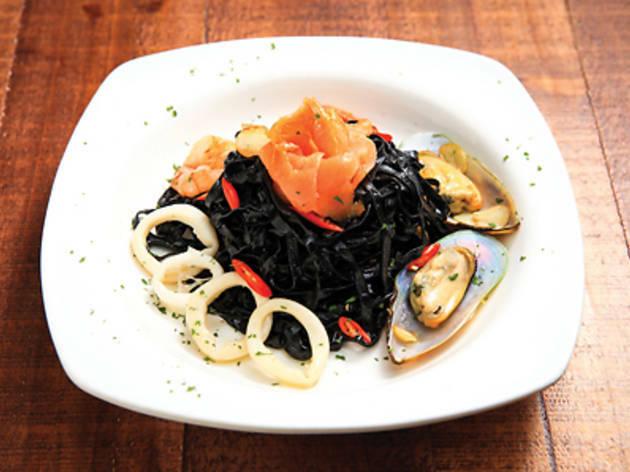 The pasta is thinner than usual but the flavours work well, with the spice and squid ink infusing into the pasta, adding interest to every bite. Thin pasta, however, may work for some dishes but it can be detrimental to others, like the Felicita signature cannelloni ($138), that comes with a mysterious ‘pink sauce’ – which turns out to be just plain old tomato cream sauce. The beef in this dish is chunky and well-seasoned but the thin pasta it’s rolled in is soggy and falls apart in the lacklustre pink sauce. We do like the idea of homemade pasta at reasonable prices in Wan Chai and Felicita 1929 serves up some hearty stuff – however some recipes clearly need tweaking. When these restaurateur pals work on the problems, though, we’ll be back to see how ‘blessed’ this Italian joint can be.